Should I be wary of a temporary employment agency that doesn’t test my skills before matching me with positions in my presumed skill set? 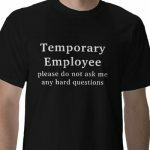 While working at a staffing company in my past, one of my duties was to find temporary contractors for short contract stints lasting anywhere from 1 night to 1 year. Sometimes the company hiring us to find these people just needed bodies to do simple small part separation from one bin into another at an automotive company. Sometimes we did have to test the potential employee in various mechanical aptitudes to see if they could fit the description given to us by the hiring company. One thing to remember though is that the temporary employment agency has a reputation to fulfill with the client hiring them. The last thing they want is for the contractor to not work out for a simple 3 month assignment. It can become tiresome for the client having to maintain turnover and the staffing company will not only lose money from each worker not being at work but also from losing the client company as a customer. So if they temporary employment agency is not conducting tests of your skills, I would assume it’s because you do not need to be tested for the type of work they will find for you. Most of the time, your resume speaks for itself. Trust me, if the client needs someone with a quality assurance background and you have an administrative background, they won’t match you up with a quality assurance job that lasts longer than a month (MAYBE if it’s a one night or one week stint). The employment agency needs to watch its turnover rates too! Even if the client just needs a body.